My dad was coming up for the weekend from visiting my grandparents and wanted to brew some beer with his favorite son. So I went to the brew store to gather the ingredients for our brew. While at the store I found out that same weekend was the Big Brew at Brew Brothers. Having no way to get my equipment down to the site I told Chris that I wouldn't be able to make it. He very graciously offered to pick up my equipment on Friday and drive it down so that I could participate in the Big Brew. The staff at Brew Brothers is amazing! Thursday March 2, 2013 I made the starter since since this was one of the first times I didn't decide I was going to brew the day I could have almost 2 full days for the starter to ferment. Typical 1000 ml starter recipe was used. On May 4th 2013, we got up early and drove down to the event, there was a lot going on but Jay and Chris from brew brothers were extremely helpful in getting my equipment set up. Since Jay had picked it up the night before and dropped it off at the store it was still in the back. While I was setting up my equipment I saw Eric, the guy that gave me the insulation jacket for my mashtun. We talked for a while and he gave us some awesome beer and orange infused carbonated water. I liked using the 1.5 qt/lb ratio because it makes for a looser mash and I don't have to worry about dough balls as much. I filled the mash-tun with 8.25 gallons of water and began heating it to 165 °F. After the water reached 165 °F I added the grain and began stirring. After stirring the mash vigorously for a few minutes the temperature had dropped down to a perfect 155 °F. I placed the mash-tun insulation jacket around the vessel and let it sit for 45 minutes. I measured a mash Ph of approximately 5.6 the test strips are not very high resolution so I had to guess. About the time that I started the boil the food was ready. Chris had made a crazy amount of home made sausages for everyone in attendance to eat they were really good. 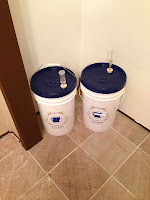 After finishing up the boil I cooled the wort and pitched the yeast into two 6.5 gallon buckets that I had bought that day. I switched to the buckets because they would be much easier to move from the event to my house than the glass carboys. The Big Brew event was a really fun time and I had a great time hanging out with my Dad, Whitney even stopped by a couple of times to say hi. A lot of people came over to look at my brew sculpture and I had fun explaining all of its intricacies to them. Great Hop aroma can really taste the Simcoe resinous flavor on the back end and smell the Citra aromatic bouquet up front.